The MASSETER muscles are responsible for chewing and can become bulky in some people due to a variety of reasons such as teeth grinding, stress related tooth gnashing, excessive gum chewing, genetics. One muscle is present on each side just in front of the angle of the jaw. Clenching your teeth while exercising or sleeping or concentrating / grinding one's teeth or bruxism can cause damage to the surface of teeth, and cause pain or soreness in the jaw and neck muscles along with spasm, headaches & tooth wearing. Over time this can lead to hypertrophy of the masseter muscle of the jaw. 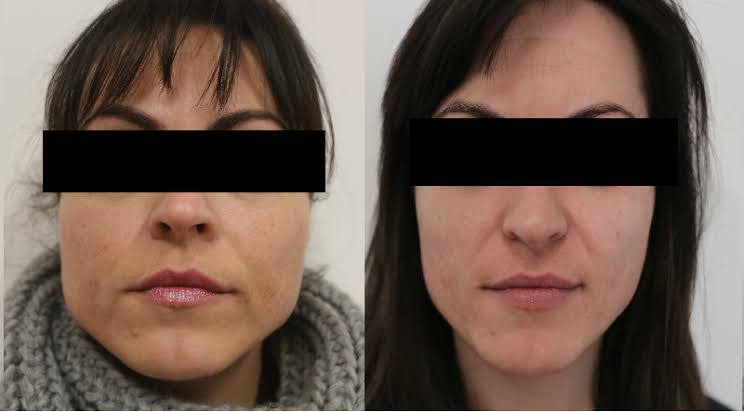 In women, especially, this can cause widening of the lower face with prominence of the platysma muscles of the neck - making one look older / more masculine or both. BOTOX can help slim down the square jaw and relieve the pain of teeth grinding (aka bruxism). It works by temporarily relaxing the large jaw muscles (masseters) on each side, for 6 to 12 months. The injection of Botulinum toxin or Botox Cosmetic can help reduce such an appearance by blocking the nerve signals to muscle fibres for contraction. Botox works as a muscle relaxant by blocking the chemical signal for muscle action at the Neuro muscular junction). It does so temporarily and reversibly. Thus having botox injections to the masseter muscles can help relieve such pain & slim down the jawline. Also, it can help turn a square or heavy masculine appearance or protruding jaw muscles to a softer feminine and more V shaped appearance & softer masseters. SUBTLE CHEEK & CHIN AUGMENTATION can help transform a round face or square face to an elongated chiseled face, if desired, in a female face. 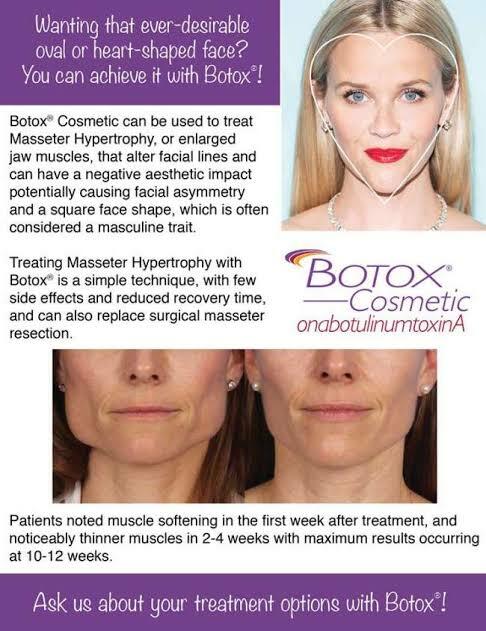 Note: Injection of Botox to the Masseter is not a USFDA approved use of the product but it is backed by published scientific evidence of safety and efficacy in clinical use. Thus it is a common but "off label" use which Dr Sonam Yadav offers at JUVERNE.